If you are looking for a simple option or trying blu for the first time, the blu® Disposable is perfect for you. blu® Disposables are convenient and come fully charged right out of the box. Ingredients include nicotine, propylene glycol and vegetable glycerin, natural and artificial flavors, lactic acid (only in the 4.5% product). Available in 2.0% and 4.5% nicotine strengths. Faster delivery with FREE UPS Ground! "Classic Tobacco is good, but Carolina Bold takes the flavor up a notch. Very pleased"
blu® Disposables come charged and ready to go in our most popular flavors. There’s no need to refill or recharge. blu® Disposables are great for any occasion, whether it’s a fun night out on the town or a relaxing night in on the couch. Single-use design means you can simply discard once it stops producing vapor. blu® Disposables feature a one-piece design making them convenient and simple to use with no extra components or unnecessary accessories. Identify the flavor of your disposable with simple flavor icons located near the mouthpiece of your device. Our multiperforated mouthpiece and improved design allow for the perfect amount of vapor and optimal flavor delivery. 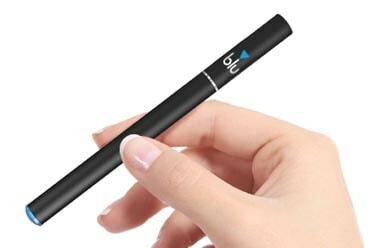 blu® Disposables give you everything you love about e-cigs in a simple, disposable, one time use package. Don’t feel like recharging your e-cig batteries? No problem! With blu® disposable e-cigs, there is no recharging. Just vape it until it’s done and move on to the next one. We designed this disposable e-cig to last, and to give you the form factor and feel of a traditional tobacco cigarette. Fits perfect in your pocket, purse or luggage for your on-the-go lifestyle. No ash, no lingering smell. With blu those fumbling days are over. Check our tips and tricks section to get the most out of your blu® Disposable. How do disposable electronic cigarettes work? Disposables come in one piece. Inside the disposable is a battery, atomizer, and the flavor cartridge, which contains liquid. When a user inhales on the mouthpiece, the battery activates the atomizer, which heats up the liquid and turns it into a vapor. The vapor is what a user inhales and exhales. Can I recharge my disposable? No. Disposables are intended for one-time use only. There’s no assembly and nothing to charge or recharge. Open the package, remove the rubber cap and take a draw from that end of the e-cigarette. How long will a disposable last? How long our disposables last depends on your own personal usage.